MY COUSIN KEEPS STEALING MY DORK DIARIES BOOKS!! My cousin loves reading Dork Diaries just like I do. 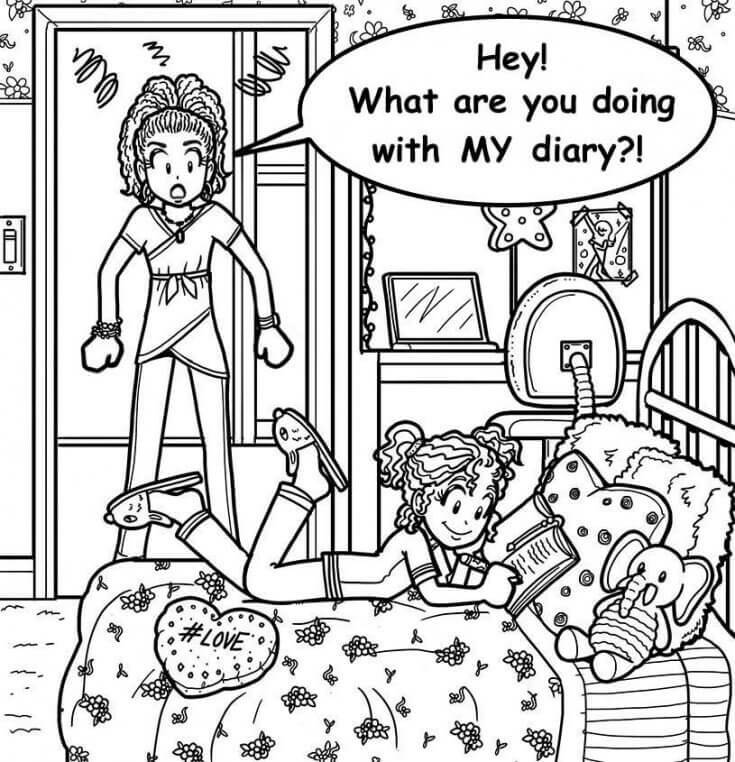 But, every month when she comes to visit, she reads MY books and writes in MY OMG Dork Diaries! She also tried to take them back to her house. I am FED UP. What should I do?! It’s hard for me to be upset that your cousin loves Dork Diaries. 🙂 It seems like it could be a fun way for you guys to connect. BUT you don’t want to have to lock up your books every time she comes over. I get that. I think there are a few things you can do. First of all, have you TALKED to her about this? I mean…that seems kind of obvious, but a LOT of the letters I get are about problems that could be solved if people just TALKED to other people. So…maybe talk to her about how much you love your Dork Diaries books and it’s important to you to keep them at your house, and that your diary is private, etc etc. But I also wonder if maybe she’s quite a bit younger than you are? Because writing in someone else’s diary seems like SUCH an immature thing to do. (Or like exactly the kind of thing Brianna would do.) So if she’s a lot younger, could you talk to your aunt or uncle? Or whatever older family member comes along with her on these visits? Not to tattle, but to explain to them that you love these books and want her to be able to enjoy them when she visits, but you’re feeling upset about how she writes in them and tries to take them home. Second, either get some bookplates or just straight-up write your name inside the books that belong to you. (Bookplates are really just stickers that go inside books that say “This book belongs to ________.”) She might be more hesitant to steal your books if your name is clearly in them, and it might help sort things out if she tries to claim the book doesn’t belong to you or something. Third, can you work with her parents/your parents to get her own OMG Dork Diary, and maybe some of the other books? Like for holidays or her birthday? I love sharing books, but this girl clearly needs some to call her own. Then maybe she’ll lay off yours! Finally, I really don’t want you to have to hide all your Dork Diaries books when she comes over. Assuming she’s not a toddler, you should be able to get this worked out. And maybe there’s some reason she doesn’t have access to cool books at her house. I dunno. But, I do think it’s fair that when she’s visiting, you take your OMG Diary with you to school or hide it somewhere secure. Because that is YOUR private place to share your feelings, and she shouldn’t be writing in it or even LOOKING at it! Are you protective of your books? How do you feel when other people want to borrow them? Have you ever had someone try to write in YOUR diary? Tell us in the comments! maybe you should bey her some books like yours for her birthbay. Dear bothersome book thief you should talk to her and say that that is your personal business and she should make her own omg dork diary. Hope this could help. I am so sorry about that!!!! Hi Nikki at the moment lots of rumours have been going around about me because my friends boyfriend found out I i I like his best friend and he told everyone including his best friend and every time we walk past each other we blush and look away and I get soo embarrassed because my friends boyfriend teases him and I what should I do and does he like me? Hope it get’s better soon! Good Luck!!! Thats a really good idea! Your cousin will LOVE you if you give her her own OMG DIARY. Then that problem is solved. Your cousin must really love Dork Diaries! Once you start reading you just can’t stop! You can buy some books for her on her birthday. I’m sure she will be happy and will thank you over and over again. I agree with you on the point to get your cousin a diary. I know how it feels to have someone write in your diary. Once, my cousin memorise TWO WHOLE PAGES of my diary and recited all over the house when she came to visit once. I know how u feel. My sister steals my things all the time! This is a CATASTROPHE!!!!!!!! I know how you feel! HEY NIKKI I LOVE YOU SOOOOOOOOOOOOOOOOO MUCH1!!!!!!!!!!!!!!!!!!!!!!!!!! My sister read through my 3 1/2 book, and all my secrets!! My sister USUALLY reads my diary until I caught her reading it then after that I told my parents about it then she never did it again.